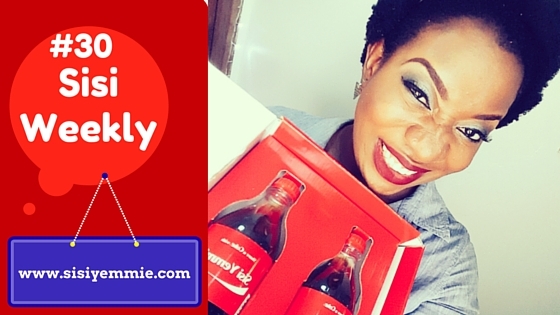 Thank you Coca-Cola Nigeria for sending me these bottles! I don't think I'm supposed to drink it abi? Well, it feels good to be Woman Crush Wednesday, eeeees not a easy something! This is so nice, Tito is a big boy now eats everything eatable. Keep up the good work,Baba God is your strength. Sisiyemmie has finished my data o. Fun watching as usual. A quick one, doesn't Titobi allow you to comb his hair? You actually look very pretty with your natural hair. It is good to switch things up once in a while, but that heavy weave you had a few weeks back detracted from your beauty. PS. Uncle Junior is looking so fresh and plump! All this yummy food you are sharing, eh. I would encourage you to start a cooking site/channel strictly dedicated to showcasing your excellent cooking skills. Keep up the awesome work. For those of us in the diaspora, the visuals of home you create are so much appreciated. hmmmm.better be grateful, some pple wld give anything to have your life..